Paige Jennings is TV’s opposite teenager. It’s a trick in The Americans’ storytelling repertoire that the show uses sparingly, but to clever ends. Expectations for a character of her age are flipped on their head: In an act of rebellion, she finds religion. As she gains an identity that’s separate and autonomous from her parents, she comes to increasingly admire and respect them. In “The World Council Of Churches,” she marvels at their ability to pull the strings that place Pastor Tim in a job within the titular organization, getting a particularly troublesome midge out of their hair for good. In a gesture that’s both an expression of relief and a little bit of a cry for approval, Paige makes a big show in this episode of removing her crucifix necklace and trashing it in front of Elizabeth and Philip. And although Elizabeth digs the jewelry out as a reminder that Pastor Tim isn’t in Buenos Aires yet, she doesn’t seem to hold this against Mom and Dad. By episode’s end, she’s back in the garage, working on self-defense, the act of hanging her improvised punching bag a shocking segue into the news that Tuan has persuaded Pasha to slit his wrists. The children of “The World Council Of Churches” want to make their parents proud. They cook dinners, display their moral fortitude, run risky operations that’ll probably get their friends killed. Their parents, meanwhile, fret about letting their kids down. They wonder about what will happen to them after a major relocation or curse the fact that they have uprooted their kids. Igor Burov voices disappointment in himself and his inability to use his position to make a better life for his sons or keep his wife out of the prison camp. The Jennings can make a call that sends a Beltway-area preacher on an all-expenses-paid permanent vacation to Argentina, but they don’t have superpowers. Their ability to protect Paige and Henry from harm will always be limited. Philip Jennings and Elizabeth Jennings (née Corman) are technically dead, after all. It’ll be interesting to look back at season five in the context of The Americans as a whole; in the short run, episodes like “The World Council Of Churches” are the greatest test of the notion that the family material matters just as much as the spy material. Tonight, those two halves cannot be disentangled: Philip and Elizabeth’s next big move will have a tremendous impact on their family, and Oleg’s past actions may forever separate him from his. Why these people do what they do is under the microscope, but not in a way that reaches for the throat like the preceding episodes—at least not until the very end. It’s then that the Jennings’ incomplete sense of control is thrown into startling relief, along with Tuan’s dangerous powers of manipulation. It’s telling that this is season five’s big life-or-death scenario: not a biological weapon (though that’s still haunting Philip and Elizabeth’s thoughts) or a rogue threat like Jared or Larrick, but a fragile kid feeling isolated in a foreign country. The distancing effects of history and genre can make the trauma of The Americans feel occasionally remote, but that’s not the case when Pasha comes home, visibly shaken and physically bruised, in “The World Council Of Churches.” The scene shares his shame, shielding Zack Gafin from view as his character rushes up the stairs. He’s just a kid, but through no actions of his own, he’s been caught in the covert conflict between international superpowers. It feels smaller than what we’re used to experiencing from The Americans, but it’s grounded in emotions that are recognizable and everyday. And it preys on a paranoia that’s hummed in the background of the past few seasons: The halo of collateral damage surrounding the principal characters is collapsing. Oleg certainly feels it, saving his mother and father from the details of the treason charges leveled against him. The less insulated the bystanders are, the more the central spies seek to tighten the familial core: Watch as Elizabeth and Philip reach for each other’s hands on the race to the Morozovs’; consider their conversation about names in the car. “The World Council Of Churches” places a lot of significance on names, like the ones Philip and Elizabeth used to have—the one he shares with the son who meets his uncle this week. When the younger Mischa dines with the relatives he’s just met, the episode does a variation on its theme of parental pride: After son tentatively calls father a “hero,” brother steps in to offer legitimate words of praise. (He’s no Olympic champion hockey player, but hey: He was pretty smart in school.) Before the scene returns to the States, there’s a wide shot of the dinner table, Mischa beaming in the light of an overhead lamp, his expression a small spot of sunshine amid the gathering clouds. It’s a lot like the smile Holly Taylor holds back when Pastor Tim tells Paige about his new job. Tim serves as an unlikely source of “advice, on a family thing,” later in the episode. It’s a meaningful coda for Kelly AuCoin, one whose uneasy alliance is far more genuine than whatever nonsense Gennadiy tries on Beeman and Aderholt. Whatever danger he still poses to the Jennings family (and they to him), Philip and Elizabeth value Tim’s expertise and ask about how Paige and Henry might adjust if they’re suddenly moved to the Soviet Union. Raising the same subject with Claudia, they’re treated like children; at the church, it’s a conversation among adults. “You can’t predict what a person’s life will be, and you can’t deny them the challenges that will shape them,” Tim says, speaking to the Jennings not as Soviet sleeper agents who could kill him and his entire family if they think he’s betrayed them, but as fellow parents. What he’ll never know is that those fellow parents are responsible for his new job or that Elizabeth recognized that Paige might want that crucifix necklace again someday. Because even when The Americans stages a conversation like this, there’s still multiple layers of intrigue running through it. 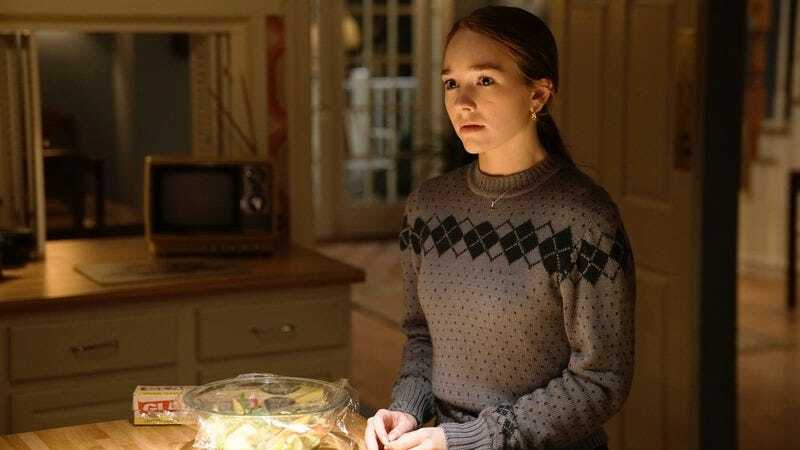 The Americans Wig Report: Season Five, Week 12: C. It’s the Eckerts—nothing wrong with the Eckerts, but “The World Council Of Churches” doesn’t really have anywhere to incorporate other disguises. The Americans Soundtrack Report: Season Five, Week 12: N/A. Tuan’s Knight Rider T-shirt got that theme song stuck in my head, though. Was there any Mail Robot? Not unless we’re counting that Knight Rider shirt. Philip hasn’t spent a ton of time at EST sessions lately, but season five is certainly the most introspective of Americans seasons. That’s really hammered (and sickled) home by the conversation between Oleg and Igor, a father-son heart-to-heart that help makes sense of Oleg’s ongoing efforts in the USSR. It’s less about keeping tabs on grocers and following the paper trails they leave, and more about taking stock of one’s own household. “We all care about corruption. It’s eating our country alive,” the elder Burov says, with particular spite from Boris Lee Krutonog. But his character has given up on the idea of reform; he did what he could to raise Oleg and his brother to be upstanding citizens, but he’s come to accept the things that he cannot control. He needs to wait two years for the steel to complete his railroad project, and he serves at the mercy of a government that’s tearing through elderly leaders like vodka-soaked, nicotine-stained tissue paper. Oleg has betrayed his country, but it hardly resembles a country worth defending at this stage. Walking the streets of Moscow (Costa Ronin was actually there), he pauses to gaze across the river at the Kremlin and Saint Basil’s Cathedral, internationally recognized symbols of his home country. But it appears to stir nothing in him. Unmoved, he forges on into the night, secure in the knowledge that he helped a woman avoid a prison sentence—but knowing how doggedly his bosses are going after everyone else identified in the investigation. Three cheers for Brandon J. Dirden, underrated Americans comic relief. Aderholt’s responses to Sofia’s happy news is some “awkward dinner with Martha”-level stuff.